If you haven’t been to the movies lately, you might want to consider making it a priority. True, there haven’t been that great of movies out recently. But if you are looking for a movie to watch for February there are a ton of good ones coming out for us to watch and review. 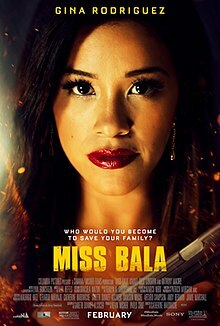 Just this month, Miss Bala just came to theaters. It is an action and adventure, drama, mystery and suspense, all wrapped up on one package. So, if you like a movie that keeps you on the edge of the seat guessing what is going to happen that is this movie. The movie is a remake of Gerardo Naranjo’s 2011 Mexican Hit, Miss Bala. Never heard of the original but you don’t need to watch that to get this one. The director of the movie was Catherine Hardwicke who has done plenty of good work. Such as the first Twilight movie she had taken roll in directing. I feel she keeps everything pretty justified in the way that she directs. By catching the right angles and making situations look real enough that you feel like you are involved with the movie. Yes, the story plot has been told in many different ways where two pretty girls get kidnapped and try to escape. But this story had a twist. The main character Gloria was played by Gina Rodriguez who also stars in the television show Jane the Virgin on Netflix, plays a comedic role. However, in this movie she had really transitioned to capture a more thriller and action character. Then you have Ismael Cruz Córdova who plays Lino who is also another main character. The two together, Ismael and Gina, really have a lot of good chemistry together that it works. They together give you like a Bonnie and Clyde feeling. The graphics in this movie where also realistic so nothing seemed too fake. Even when it is a PG-13 movie it is still emotionally attachable. This movie showed the ups and downs that women go through as well — meaning it was sending a message of girl power. So if you are a female you may like this movie even more. Because it does show the sexiest way men can be to women to make them feel helpless and alone. Also, showed how the justice system for Mexico and USA was corrupt in helping people. That they only tell people what they want to hear to get them to do what they want to do. Not saying this is true but how do we know. Some AIC students had gone to watch the movie for themselves and had some things to say. Rugby star and AIC junior Tommy Clark gave the film high grades. “I really enjoyed the movie because it was something different then your average kidnap movie. Every time I had guessed something, I was wrong. Then when it came to the end of the movie I was just speechless,” said Clark. AIC student Malik Walker agreed. “I haven’t been to the movies in a while because there was nothing good. But then the guys wanted to watch this girl movie and I was prepared to be bored by it. After watching it I would defiantly watch it again,” said Walker. Overall what people had said was nothing but good thoughts about this movie. Don’t worry though the movie just came out so if you want to be the judge of it. Go ahead and head out to the closest movie theater to watch it now. You should go watch now!